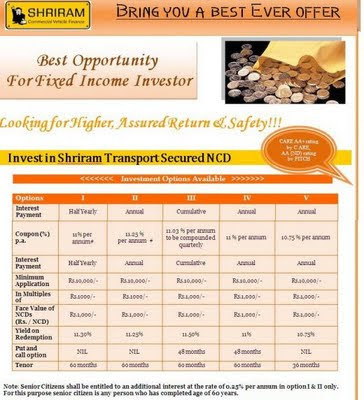 Shriram Transport Finance Company Limited after its attractive Fixed Deposit Offering, came out with a Issue of Secured Non-convertible Debentures (NCDs). Shriram Transport Finance which is among the leading asset financing (commercial vehicle financing) NBFCs in India. The Compnay has a 25% market share in pre-owned truck finance market and has a 7% market share in New Truck Market. The Company is offering 5 investment options. Investment 3 and 4 come with Put and Call Options at the end of 4 years. The issue offers Coupon rates ranging between 10.75% to 11.5%. Option I: It pays interest every six months and has an effective yield of 11.30 per cent. Redemption is staggered in the ratio of 40 per cent, 40 per cent and 20 per cent at the end of 36, 48 and 60 months respectively. Option II: It pays interest annually. The principal is redeemed as under option I. Senior citizens are offered an extra return of 0.25 percentage points under both these options. The effective yield on this option comes to 11.25 per cent. Option III: It offers an interest rate of 11.03 per cent compounded quarterly, with the effective yield coming to 11.50 per cent. It is a cumulative option and hence offers the highest yield. This option comes with a put and call option at the end of 48 months. Option IV: This option pays interest annually. The yield comes to 11 per cent. Put and call option are available at the end of 48 months. Option V: This option has been designed for those who want to invest for only three years. The interest rate has been capped at 10.75 per cent and there is no Put and Call option. The maturity amount is paid at the end of 36 months. Depending on the option you choose, you will get interest semi-annualy, annually or on a cumulative basis. The minimum application amount is Rs.10000 and in the multiples of Rs.1000. HOW SAFE IS YOUR MONEY??? The NCD has been rated CARE AA+ by CARE and AA (Ind) by Fitch, which indicates that the company is stable and capable of timely servicing of debt. Further, the NCD is secured by the company’s assets. Consequently, the claims of NCD holders will be superior to the claims of unsecured creditors (like company FD holders, which are unsecured deposits). Bank FDs are insured up to a maximum of Rs 1 lakh. 1)No TDS is payable on Interest Income. 2)Ample liquidity due to listing of NCD on the NSE. 3) Interest recd will treated as “other income”and so will get added to your total income and taxed at the marginal tax rate. 4) If you sell at the stock exchange after 12 months, your gains will be treated as long-term capital gain and will be taxed at 10 per cent without indexation. If you sell in less than 12 months, your gains will be treated as short-term capital gains and taxed at the marginal income tax rate. 5)For low risk taking investors this issue offers a unique opportunity. The current rate on bank deposits is for a tenure of 48-60 months is between 7.5%-8.0%. This issue can earn an investor a spread of 275-350 basis points at a negligible incremental risk. 6) Shriram's Interest Coverage Ratio of 1.49 indicates its ability to service the interest on debt and is better than other Finance Companies like Gruh finance and HDFC. Even for a risk-averse saver bitten by ever falling Bank FD rates, NCDs are great alternative. After all, a three-year fixed deposit will earn you 6-6.5% interest, but a three-year NCD will fetch between 10.5-10.75%. Good One! That was quite convincing. Too late to apply for this NCD. Free Reviews tend to be late. Pay me my consultation charges and you will get Advise on time!! !